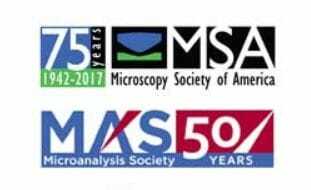 The Microscopy Society of America (MSA) Student Council's Inaugural Pre-Meeting Congress (PMC) for Students, Postdocs, and Early Career Professionals will be held in conjunction with M&M 2017 in St. Louis, Missouri! The Student Council was created to promote participation in MSA, cultivate leadership that can sustain the future of the society, and to provide students and young scientists opportunities for professional growth within the scientific community. The PMC is a first-of-its kind event tailored specifically for young, emerging leaders in microscopy and microanalysis. The MSA Student Council Inaugural PMC will be held at America's Center Convention Complex on Saturday, August 5, 2017. Please join us for outstanding research presentations in microscopy and microanalysis from students and emerging scientists representing biological and physical sciences. 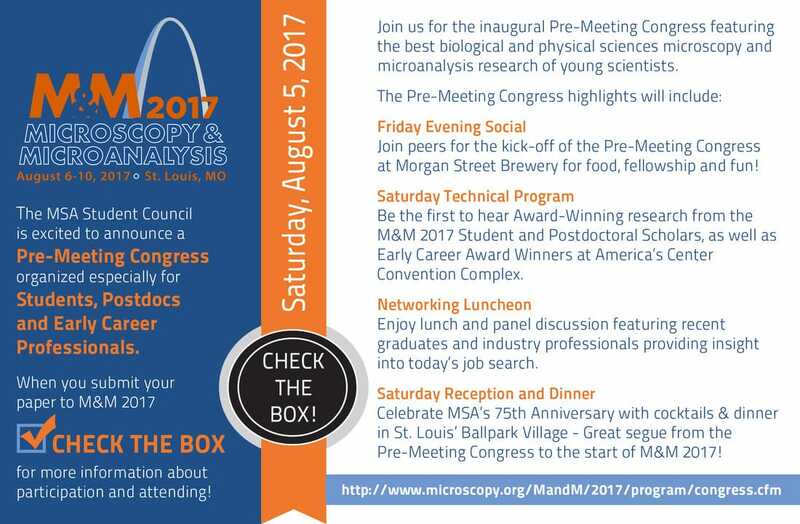 The PMC provides opportunities for social outings, a preview of Award-Winning research from the M&M 2017 Student and Postdoctoral Scholars as well as Early Career Award Winners, professional networking luncheon, and a reception and dinner to segue into the start of M&M 2017. For additional information on the MSA Student Council Inaugural PMC, please see the attached flyer and visit the conference link, MSA Student Council Inaugural PMC. The MSA Student Council Inaugural PMC and M&M 2017 are a wonderful opportunity for Students (undergraduate and graduate), Postdocs, and Early Career Professionals to network with peers and members of academia and industry as well as vendors from a variety of top companies. Please consider submitting an abstract to M&M 2017 by February 15, 2017 and remember to "Check the Box" on the paper submission page to receive additional information about the MSA Student Council Inaugural PMC. Kick-off of the MSA Student Council Inaugural PMC at Morgan Street Brewery for food, fellowship, and fun!